I would have NEVER imagined 3 and a 1/2 years ago that something I created to distract myself from school and athletics that seemed all encompassing would have lasted this long. When I began my blog right before Christmas break of my junior year of High School I never really had any long term goals as I sought to blog solely as a hobby. While it has remained my favorite and consistent hobby it has grown beyond belief. I remember my hesitations when it came to other people finding out about Prep In Your Step and now I find myself confidently bringing it up in conversations. Thinking back now I can't imagine not having a blog at this point in my life no matter how foreign of a concept it seemed to people at the time of my genesis in the blogging world! I have been able to connect with people and brands all over and have been given opportunities I never would have fathomed all from my tiny slice of the internet and I can't thank y'all enough for your constant support and sticking with me through this fun little journey. Some of my favorite emails to receive are the ones where readers email me telling me that I have inspired them to start a blog. Before blogging I am not sure if anyone would have been inspired by anything I had done and now I get these emails pretty frequently. Nothing is more satisfying and exciting to me since blogging has become something I adore and such a big part of my daily routine. While I wish I was a bit more helpful each time I respond I thought it would be great to share my tips on how to start a blog with anyone willing to read! I am by no means an expert and I don't necessarily draw in 100s of 1000s of readers each day but I have learned a bit in my 3 and 1/2 years of blogging. Also, these tips are not in a specific order but instead should all be taken into account when opting to start a blog of your own! Start with Creating a Theme. So what do you want to write about? 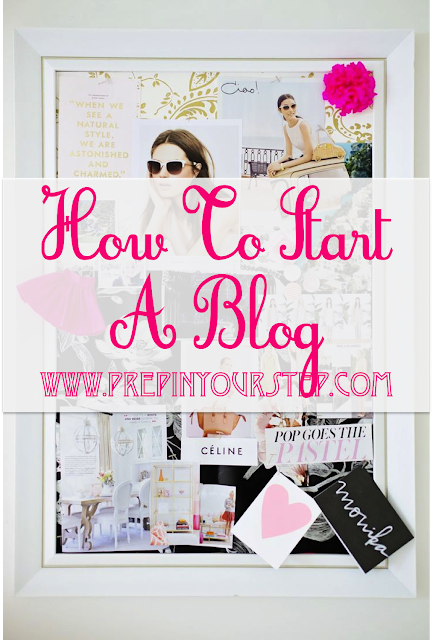 Determining a subject is crucial when it comes to deciding to start a blog. For me, I feel as though my blog fits into a few different categories. I share advice and tips, talk about my life, ramble about products, and generally just like to share information with y'all. While I love this flexibility and hate the idea of people feeling confined by an overarching subject matter of their blog it really is quite helpful when you are starting out. I decided that I wanted to express my style through my blog and I grew from there. The good thing is that your blog can transition with you as long as you are passionate about what you are sharing with your readers. Choose which platform you'd like to use (I use blogger). From the get go I have used blogger. My blog is still run through this publishing platform although I have since purchased my own domain name. I love blogger for what I do although I know that many people find Wordpress to have more features. In retrospect I would have done more research comparing the two and then make my decision but so far I have been content with blogger and don't plan to switch to wordpress any time soon. Select a template that you can customize later on if you decide you want to stick to it. I get a lot of questions about my template and I wish I had answers for y'all regarding it. I am pretty clueless when it comes to blog designing and once I realized that Prep In Your Step was something I planned to stick with I decided to pay a blog designer to customize my layout. For years however, I used a blogger template that through watching a lot of youtube videos I figured out how to customize with different colors and a logo. Come up with a clever name that you can grow with. So you're a freshman in college currently? I strongly encourage you to keep that out of your title since it seems to stunt growth and you surely won't be a college freshman forever. You want your blog title to have the ability to grow up with you. Personally, due to my love of puns, Prep In Your Step became my favorite title that I spent quite a few weeks brainstorming ideas for. Coming up with a title is honestly one of the most challenging parts especially since I was determined to have something original that no one else had used before! Once you have chosen a title be sure to do you research to make sure someone else isn't already using it (since great minds think alike). I always get really frustrated when I see instagrams and other blogs playing on the name Prep In Your Step since I spent such a long time coming up with it, making sure no one else had used it, and making it my own. Who are you writing for? I tend to write towards girls from early teens well into their twenties (besides my dad and grandfather who both impressively keep up with my posting). While the range will surely be broken the majority of my demographic falls in this realm. By figuring that out early you are better able to gear your content and attract the audience from that range. In addition to your title coming up with your first few post ideas can be time consuming. Whenever you think of an idea that could potentially be used for a blog post be sure to jot it down. I constantly have multiple lists running with different potential blog posts topics and this is a surefire way to keep you from running out of ideas. Write a few posts before publishing/ announcing your blog launch. This kind of goes along with brainstorming ideas but by already having a few posts ready to go in your archives you are already getting a feel for blogging and practicing posting things that fit your theme and target audience. These are also a great way to make sure that your creative juices are flowing. Use quality photos (preferably your own). This is a bit ironic considering the backgrounds from both of the images I used in this post are not my own. There is a time and a place for sprucing up others images but I can't help but love when a post solely contains my content from writing to photographs. Get out your camera and start snapping away chances are no matter the subject a pretty photograph can be used in a post! Something pretty much every blogger struggles with at some point is consistency. It stinks to find a blog that seems to be your blogs kindred spirit only to find out that they only stuck with creating content for a month. If 3 posts a week is the most you can commit to then stick with it. In the beginning your consistency is much more important than your frequency. Make a Blog Email Account. This is a great way to look more professional as a blogger and to keep all of the information you need regarding your blog in one place. My blog email account is through gmail and I can't imagine corresponding with readers, companies, and others through a personal and non professional email account. This makes things so much easier for you and for those attempting to reach out to you and will hopefully make sure that nothing gets lost in translation. The blogging world has grown so much since I started and there are constantly new blogs being created making it even harder to become noticed. One way to draw in readers is by being original and not stealing other peoples content. Write about what interests you and share your personal opinions of various topics. While in the blogging world there is often an overlap in topics as would be expected and as should be accepted approach the topic through your own point of view! Create corresponding social media accounts and promote your content. Here comes the fun part! Create an instagram and twitter that correlates to your blog (preferably with the same name) and have fun spreading the word about your content! For example mine are @prepinyourstep leaving y'all with few questions about whether or not it goes along with my blog. Social media accounts are a terrific way of engaging with readers and allow those following you a more in depth look at what you're up to. Don't be hesitant when it comes to following, liking, and genuinely commenting on other accounts! A great (and free) way to gain publicity for your blog is by leaving genuine comments on blogs that may reach a similar audience. Some of my favorite blogs to read were ones that I originally discovered due to their comments on other blogs I read! 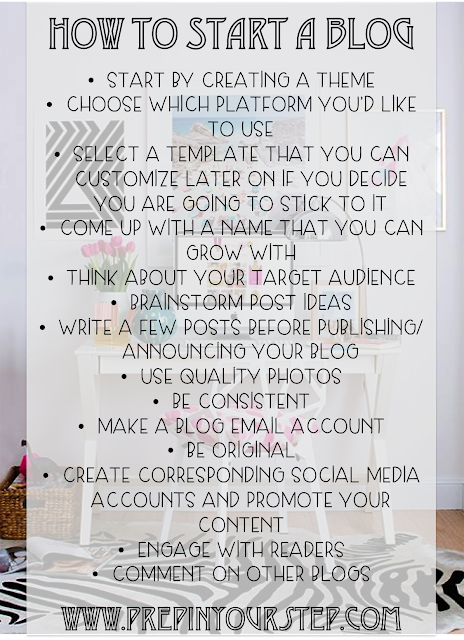 While these all may seem like basic tips if you're looking into starting a blog then these are tips that you should take into account. While it will take a while to grow your blog and get to the point where you've built up a loyal following you're one step closer once you've started and actually created your site. And it will hopefully be easier to be successful by beginning your blog with these tips. Just remember that it takes a long time and a lot of consistency to grow your blog but keep pushing through and enjoy the process. What is the best advice you have for someone looking to start a blog? Great tips! I wish I had known all of these when I began blogging but many things were just trial and error! Love this post Dorothy. Great tips for upcoming bloggers! Great advice! I wish I had some of these tips when I first started! Awesome tips! I just relaunched my blog and this helped a lot with some questions I had. Love this post Dorothy! I agree with the name thing, it took me months to come up with the perfect blog name! Thank you for the great, helpful tips! I recently started my blog and I cannot wait to see what will come from it! Love your blog! such an awesome post! thanks so much! This was so inspiring! Thanks for the post! Thanks for the helpful tips! I just started my blog and I am so excited to see where it goes! Thank you for this post. I find this post like this very helpful because they remind me to be consistent. I been having trouble with that. If you don't mind me asking, do you have any tips for keeping consistent. Wow loved this post! I'm so glad I read this because I recently started my own blog and really enjoy it! Thanks again! Thank you so much for this advice! I am so excited to get my blog started! Your blog was one of the first that I began reading shortly after I started my own! I definitely love that "kindred spirit" feeling! I've been thinking about starting a blog as a possible summer hobby and as a way to look back at starting college and you just convinced me! Thanks for the great tips! I love your posts and this one was so helpful because I just started my own blog! These are great tips! I just started a blog and yours is one of the blogs i am in love with. 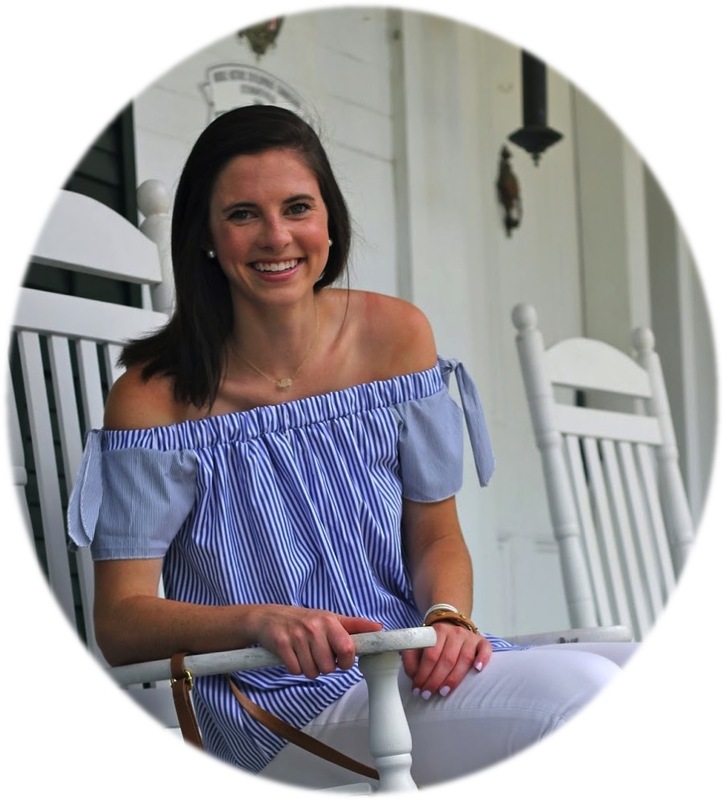 I am seriously in love with your blog Dorothy! It's so cute and you have such a positive outlook on things! I was so inspired by Prep In Your Step that I decided to start my own blog classwithatouchofsass.blogspot.com I'm so excited to begin this blogging journey and I look up to your blog so much! Thanks for everything that you do!